One year ago today I launched this blog, on July 4, 2010. At the time, the city of Oakland was clenched in preparation for the ruling in the Johannes Mehserle case, and predictions abounded that the city would suffer a tremendous beating at the hands of looters and rioters. Of course, the involuntary manslaughter verdict was announced and outrage commenced, albeit far more peacefully than some had predicted. 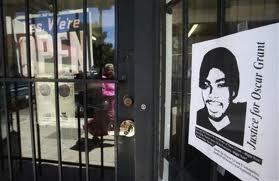 Months later, the former BART police officer was sentenced to two years jail time, minus time-served, for killing Oscar Grant on the platform of the Fruitvale BART station in Oakland. Mehserle was released from jail a few weeks ago, on June 13, in Los Angeles. Since then, talk of the case has diminished, the photocopied images of a smiling Grant (once posted on countless Oakland storefronts) razored away and Windexed clean. Occasionally, a Grant poster still pops up here or there, his cherubic face staring back at me through the glass window of a barbershop or bookstore, but it has been a while since I have seen one. Maybe a month or two. Alas, the last legal leg of the incident was “resolved” last week, as Grant’s mother agreed to settle with BART for a sum of 1.3 million dollars, damages paid to compensate for the loss of her son. And with that the final chapter closes as, once again in our society, cries of anguished protest are seemingly brought to silence by nothing more than the gentle clink of a coin into a cup. A year later, I’m still thankful for my family and friends, and for my wonderful East Oakland neighborhood in the summer—with its sounds of chlorine-scented children playing on the block, the ice cream man’s jingle as dusk settles into night. And although, as always, I am wont to romanticize summer and the Fourth, I find myself currently distracted by a story on the television, reports that just a few hours ago on Sunday evening, another man was shot and killed by BART police, this time in San Francisco. Currently, the story is sketchy, but there are already questions as to why a gun was used instead of a taser. Ah, ain’t nothing like a little déjà vu to give a blog post relevance. I’d allude to some sort of firework metaphor again, except that Katy Perry has all but ruined firework metaphors for me this past year.